I am directed to intimate that the above mentioned examination was held on 15th & 16th October, 2011 in 21 Centres. 2. After conducting the Examination, many grievances from the candidates who took the Examination and from Service Unions/Associations have been received alleging prescribing of certain questions outside the syllabus in respect of Paper-III of IP Examination 2011 held on 16-10-2011. The Competent Authority, therefore, ordered to constitute a Committee of departmental officers for examining the grievances. The report of the Committee has been carefully examined and the Competent Authority ordered to hold a re-examination in Paper-III of IP 2011 as per the prescribed syllabus. 4. 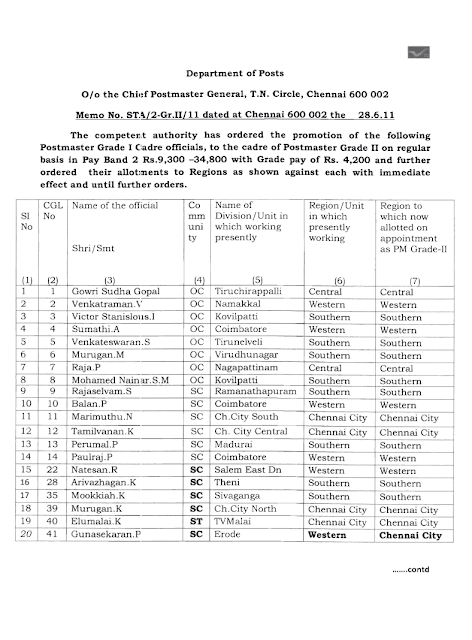 The Re-examination will be for the candidates who actually appeared on 16-10-2011. The number of candidates appeared is furnished in enclosure. Due to paucity of time, the outsourced Agency is unable to dispatch the Admit Cards to the candidates physically and instead Admit Cards will be displayed on the Indiapost website and the candidates may be instructed to download the Admit Cards and to appear at the prescribed Venues alongwith Photographs. 5. The contents of this letter may be given wide publicity and circulated to all the concerned to avoid any personal grievance. The results of the LDCE Gr B Exam held on 29.05.11 has been released today evening vide Dte Memo No. A-34012 / 01 / 2011-DE Dt. 23.06.11. ALL INFORMATION PROVIDED IN THIS SITE WILL NOT ATTRACT ANY LIABILITY. WHILE WE TEND TO PROVIDE VALUABLE INFORMATION WE DO NOT GUARANTEE THE ACCURACY, CORRECTNESS, COMPLETENESS, GENUINENESS etc., OF THE INFORMATION POSTED. WE ARE NOT RESPONSIBLE FOR ANY LOSS OR INJURY OF ANYKIND THROUGH USE OF OR DISPLAY OR VISITING LINKS IN THIS SITE.